Why cook a gourmet meal when you can defrost it? A Christmas ham takes at least a couple of hours to prepare, and that's on top of making the sides, the appetizers and, of course, the dessert. Or you can just defrost the whole thing. Say goodbye to the TV dinners of yesterday with mystery meat and frozen carrots. Walk down a frozen food aisle today, and you'll find the ready-to-eat meals of the past have gone gourmet, with options like beef bourguignon and sesame ginger wild salmon. Sales of frozen food for the last year are over $47.9 billion, according to Nielsen. The market is heating up, and the holiday season is a great time to outsource meal preparation. "One of the trends we're seeing is that frozen foods are evolving; it's similar to what happened with craft beer," said Phil Lempert, a grocery expert and consumer behavior analyst. He said more companies are investing in unique, artisanal frozen products that have recognizable, transparent ingredients list and focus on an authentic taste. Last year, the National Frozen and Refrigerated Foods Association launched an ad campaign with the lines, "Real food. Frozen," which includes videos on how foods in the freezer case come to be. "They're chef-inspired recipes," said Skip Shaw, president of the association. "Basically we're doing something everyone would do at home, but freezing it." While traditional food companies have expanded the offerings, one business has upped the ante and opened a store completely dedicated to gourmet frozen food -- the first in the nation. "Frozen is the new fresh," reads the writing on the wall at Babeth's Feast, which opened this summer in New York City's Upper East Side neighborhood. Owner Elisabeth de Kergorlay, a French-born food entrepreneur, said increasing her sales isn't just about taste. It's about changing the way people think. "You wouldn't think, 'I'm going to buy a good pre-made meal so I'm going to go to the frozen section.' You think the deli or a specialty store," de Kergorlay said. At her store, a kitchen in the back churns out samples all day long, starting with pastries in the morning and moving on to hearty meals into the evening. 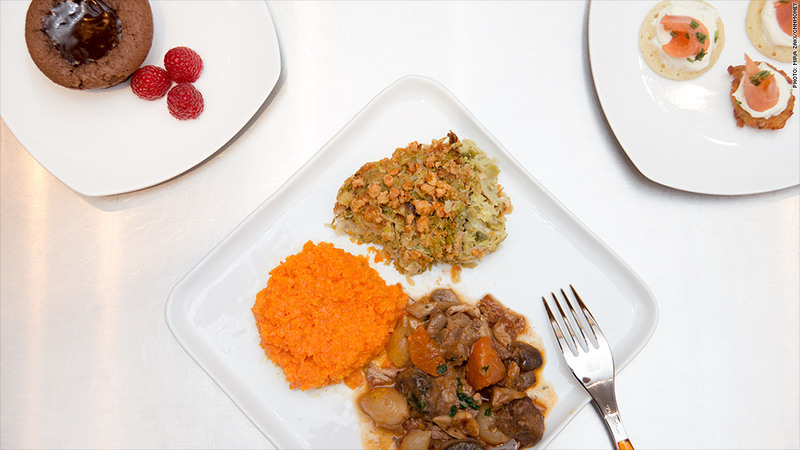 The samples range from lobster risotto on the half shell to paprika braised lamb with turnips. "There's the idea that it's going to taste bad, or that it's going to be salty," she said. She called the moment a customer tries her product "the element of surprise" because it tastes better than expected. Babeth's Feast offers 400 products. The newest items were created especially for the holidays, like turkey roulade with cranberry and apple stuffing, and a Brussels sprout dish that comes topped with a cheddar cheese crumble. If frozen food doesn't taste good, it's not because it was frozen, de Kergorlay said. "The truth is, it wasn't good before it got frozen. That's really the hurdle."